Whether you are doing a country theme, mountain theme or log cabin style theme to your home, one of the vital things that will set the scene when someone walks into one of your bedrooms is the bedding set you have chosen. When you think about it, the bed is the centerpiece of the room. Therefore, you need to make sure you have chosen bedding that suits the theme of what you are trying to portray to those who walk into the room. The Elk Ridge Comforter Set can do that. By depicting a moment in the woods where you and the elk are eye to eye and you can almost smell the evergreens surrounding you. This bed in a bag set will remind you of taking a retreat to a log cabin in the woods. These pieces will take your bedding to the next level. You can begin with a simple bedding set that is in complementary colors and then add these pieces to the set to go from an ordinary bedroom setting to an extraordinary one. The Elk Ridge Comforter set is available in twin, full, queen and king sizes. For a change it is a piece that looks just as good in reality as it does online. This will not disappoint in appearance. This is a heavy duty bedding set that holds it’s space well and looks substantial instead of other beds that often look wrinkly. The heavyweight fabric will keep you nice and warm when you are bundled up underneath it on a cold night. 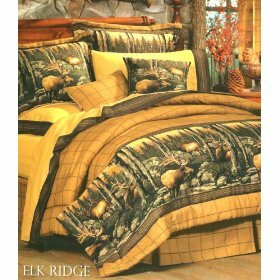 CLICK HERE to buy the Elk Ridge comforter bed in a bag set. This gorgeous bed in a bag comforter set will certainly give your bedroom a luxurious look. It’s no wonder its considered to be a bridal set since it is opulent and elegant. 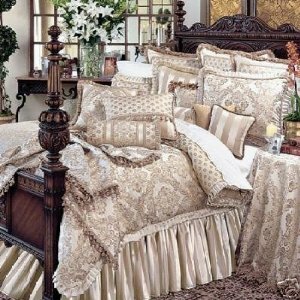 This is not just for brides of course – if you just want a bit of luxury then this Luxury Bed in a Bag Comforter Set is for you. it will certainly add style and glamor to your bedroom decor. It comes with an oversized comforter, shams, and a bed skirt so you are really getting a lot for your money with this bed in a bag set. The material itself has a beautiful paisley jacquard design and the comforter is reversible. What’s Included in the Luxury Bed in a Bag Bridal Comforter Set? Roxy is designed to make your child’s room a welcoming place to be. The colors are bright and sunny, just what kids love. And when you buy a bed in a bag you have the convenience of having all the pieces you need to give you a totally coordinated look. The various colors displayed on a bright bubble gum pink background gives you the added convenience of being able to add accessories in a number of different toning to achieve a coordinated look. It also means that you can change the look of the room by simply changing the accessories using a different color. The set is made from Cotton/Polyester which means it can be machine washed and dried on low heat. The comforters and pillows have polyester fill and it is recommended that you dry spot clean pillows. Amazon.com have a great range of Roxy bedding to choose from. This is a great ensemble for your young teen or tween. What’s a tween?…well it is someone who is not quite a teen but still not quite a kid…. they’re just somewhere in between. The InStyle Home Collection Camouflage Bedding Ensemble includes everything you’ll need to set up your child’s bed. 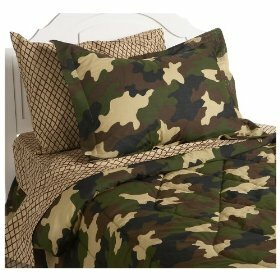 The camouflage look is printed on the comforter, one of the pillow cases and the bed skirt. 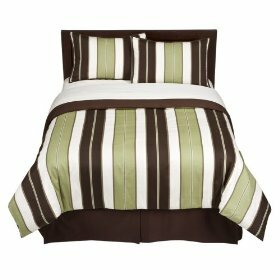 The sheet set including the pillow set are in a contrasting neutral color with a lined print. The set is machine washable and dryer safe on a low setting.